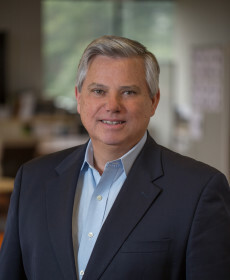 Jim, who works in our Charlottesville studio, brings more than three decades of leadership and expertise in senior living design, memory care design, historic preservation, public safety, K-12 and higher education projects. Scattered throughout the Commonwealth of Virginia, his projects have garnered design awards from the AIA, the Preservation Society of Virginia, and industry associations. Jim is known for his passion for design, attention to detail, and client relationships. His design solutions are always client centered and exhibit enduring, sustainable value. As a regional leader in the architectural community, Jim has served the profession in a variety of capacities including AIA component chair, state AIA Vice President, AIA 2030 Initiative, NCARB Mid Atlantic Regional Vice Chair, NCARB Prize Jury (twice), and AIA Virginia Honors Committee. In 2007 Virginia Society AIA recognized Jim’s efforts with the VSAIA Distinguished Achievement Award and 2010 AIA Central Virginia awarded Jim their Community Service Award for outstanding professional leadership.